My mother was a resident of The Lodge for over 3 years. She enjoyed her time there. She was able to find a group to play bridge with and had a great time at bingo every night. The owners are genius at hiring caring and compassionate employees. My mother had some mild cognitive impairment and the staff was wonderful to her. I highly recommend The Lodge. Your loved ones could not be better taken care of. We moved my dad to Waters Edge Lodge in May 2017, and couldn't be happier with how well he is taken care of. The Caregivers, Nursing Staff, and Admins are great! We no longer worry as we know he is in good hands. Due to his level of care he resides on the first floor receiving premium care which is all inclusive unlike most facilities that are a la carte. We had visited several facilities, and were getting discouraged until we walked in to Waters Edge Lodge and immediately knew we had found the best place for my dad. His room has a beautiful view of the lagoon, and he enjoys nightly Bingo and Movies. They also have activiies throughout the day, and if he needs to go to Safeway or CVS there is a walking path that leads right to the shopping center. We visit dad 2 - 3 times a week and both the employees and the residents always seem genuinely happy...which tells me alot! We also enjoy the fresh Peets coffee and Otis Spunkmeyer cookies in the cafe while we visit with dad :-). The studio apartments at Waters Edge Lodge were good, clean, and well maintained. The staff was warm and friendly. The amenities were good. The place was a clean and serene environment. Waters Edge Lodge was clean and nice. The staff was very helpful. The residents could watch TV in the living room. They had a piano and different activities. They took them out to the movie theater. The food was good. Waters Edge Lodge was very clean and well-kept, and it looked like they had lots of activities. It's a very beautiful in terms of location. The difficulty for us was my father-in-law is wheelchair-bound, so the facility would not work for him. I've since learned of other people living there who are doing very well. It's a clean, modern facility. I like living here. The staff is very friendly and helpful. The staff knows all our names. I can walk to Safeway and CVS. Our lodge is on a lagoon. It's very beautiful and peaceful here. I can participate in many different activities. Sometimes, I don't like the food. Very caring, thoughtful, and always doing extras for me. Came in for a tour of the facility to see if it would be a match for my grandma. It was so welcoming. When we arrived, it literally smelled like chocolate chip cookies. The residents were so nice and engaging. My grandma isn't ready to move yet, but she knows Waters Edge is her first choice. I love this house and the people are so nice & helpful. They take good care of us. We have plenty of things to do. The food is good. The people who work here are caring and helpful. Waters Edge Lodge welcomes residents as family. All staff knows each resident and cheerfully assist them. I’ve lived at The Lodge for 2 ¼ years. I’m 93 years old and I hope to live to 100 years on this warmth and caring community. Waters Edge Lodge is a wonderful residence for seniors who are mobile. It is close to a small shopping centre and along a beautiful waterway. The staff is exceptional and there are many activities that residents can participate in. The fees are reasonable. My father was here for 8 years and was well cared for. We're very happy with the service at Waters Edge, and we think that they are very attentive and kind. My mom's room is small, but she has a very nice view. She likes the food, so I would say that the food is OK. They have music every day, they have various classes, and they have outside events that they organize. I like the location because it is close to my home. I talked to some other family members who had their parents there, and I got really personal feedback. I like the size: not too big, not too small. Waters Edge Lodge wasn't super nice, but it was OK, and the location was great. The staff was really nice, and the place seemed happy. I saw the dining room, exercise room, a little café, and a rec room. The apartments that I saw were good but smaller than I thought. Describe the overall population of assisted living residents at Waters Edge Lodge. What is their average age? What are their favorite things to do? Lodge residents range in age from 70 to 100 who are active and looking forward to each day's activities and events. Residents love the daily music concerts and the robust choices for exercise and wellness, as well as the interesting "Great Courses" classes and our enjoyable parties. What programs or activities does Waters Edge Lodge offer to enrich residents' well-being? Our Activity program offers a wide variety of choices, much like a cruise ship. Our Exercise & Rehabilitation wellness center onsite has significantly reduced resident falls. What places are near Waters Edge Lodge or within walking distance for assisted living residents to enjoy? Shopping center with Safeway, CVS, lots of great restaurants, public library, golf course, community center, religious communities. BEAUTIFUL flat walking path to the bay. What transportation services does Waters Edge Lodge offer to assisted living residents? For a small fee, The Lodge van can take people to their appointments. 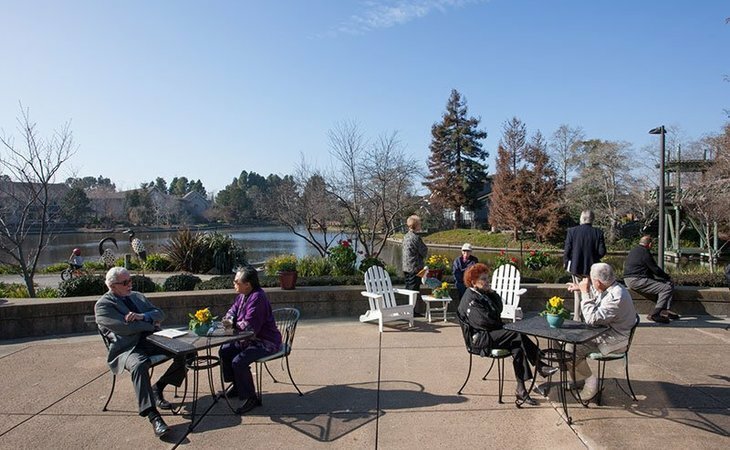 Every Wednesday there is a FREE Alameda Senior Shuttle that stops at The Lodge and circles the Alameda island. What makes the chef or dining program at Waters Edge Lodge exceptional? What kind of menu can assisted living residents expect? Our chef cooks a wide variety of delicious choices for every meal and creates themed menus with international recipes to celebrate our wide variety of ethnic and cultural diversity. What safety features or security measures does Waters Edge Lodge offer to assisted living residents? The Harbor Bay/Bay Farm community here in Alameda is one of the safest in the Bay Area. We have multiple security cameras and a computerized sign-in process (Accushield) for residents & all visitors. How does Waters Edge Lodge keep residents' families informed about their loved ones? AEC Living has a monthly newsletter which highlights Lodge activities and resident happenings . We stay in contact with families and schedule care conferences to address residents' health & safety. If Waters Edge Lodge accepts dogs or cats, what indoor/outdoor areas can they enjoy? We have locked protected courtyards where residents can enjoy the outdoors with their dogs. And this neighborhood is known as one of the best dog walking spots in the area. Flat and quiet. What ongoing senior care training does the staff receive? We have a very strict schedule of ongoing training and monthly updated training for all staff. What safety features or security measures does Waters Edge Lodge provide to protect residents who wander? We do have a "wander guard" system for residents who cannot leave the building unassisted, however those with confusion or wander issues should apply for admission to Elders Inn. Island life at it's best! Off the beaten path but close to everything you need. The ​Lodge is nestled on ​peaceful ​lagoon ​on Bay Farm within Harbor Bay. ​ Our 101 apartments provide a warm and familiar atmosphere where residents can maintain an independent and active lifestyle. We offer an extensive list of programs and activities, creating a stimulating social atmosphere where friendships develop and thrive. Residents may also enjoy the many walking trails in the community or visit one of the many professional services, cafes, shops and major stores at Harbor Bay Landing Shopping Center located next door. The Lodge provides exceptional care that roots from wonderful staff who have stayed and committed to the work. There is an out of the ordinary low turnover of staff, with many who have worked for the company for 5 to 25 years. Lovely gardens; peaceful and striking? view overlooking the lagoon, and an exceptional activities program, The Lodge has set an industry standard in residential care for more than 25 years. What should caregivers and potential residents know about Waters Edge Lodge?